Researchers have long wondered where Darwin’s Galápagos finches originated from and have identified a few possibilities, but conservationists face a different challenge in protecting the archipelago’s biodiversity. Galápagos finches are famous the world around as a prime example of the process of evolution and adaptive radiation. Long before finches inspired Darwin, they were not “Galápagos finches” but simply a species that settled the archipelago from somewhere else. The question: where did they come from? The answer: no one fully knows, but researchers have a few theories. Ever sinces Darwin’s 1839 voyage on the HMS Beagle, researchers have been enthralled by the evolutionary history of these finches. Modern research methods have revealed that the finches form a monophyletic group, meaning they all evolved from a single ancestral species that arrived on islands an estimated 2-3 million years ago. The oldest fossils ever found are from the Holocene period less than 10,000 years ago and belong to two species of extant ground-finches, Geospiza nebulosi and Geospiza magnirostris which give researchers an idea of their appearance but no clear idea of their origins. Due to the archipelagos proximity to Ecuador, many scientists have considered the likelihood that the finches evolved from a mainland species. Avian biologist, David Deadlam suggested in 1982 that physical and behavioral similarities tie the species to Blue-back Grassquit (Volatinia jacarina) which is found throughout South and Central America. Other studies looked at the mitochondrial DNA of the species and found the finches are most closely related to another species of Grassquit found in Central America but had spread to South America. Alternatively, a few studies have concluded that Galápagos finches might have evolved from a Carribean species. Although it might seem like a stretch for finches to have originated from the Carribean, they are not the only Galápagos species to show such a connection. Galápagos Mockingbirds have also been linked to the Carribean as a potential location of origin. At the moment, no conclusive data exists making it equally as probable that the finches came from South American or the Carribean, but further researcher will continue to explore the evolutionary history of these species. For now, while researchers continue to understand the process of evolution these species went through, conservationists are faced with the challenge of protecting these species from one of the greatest threats they face – invasive species. The Galápagos archipelago is known for the diversity of these species, but the introduction of invasive rats, cats, and goats have posed significant threats to their continued survival. Floreana Island is a prime example as the Floreana Mockingbird, one of four Galápagos Mockingbird species, is faced with extinction and can no longer be found on its namesake island. 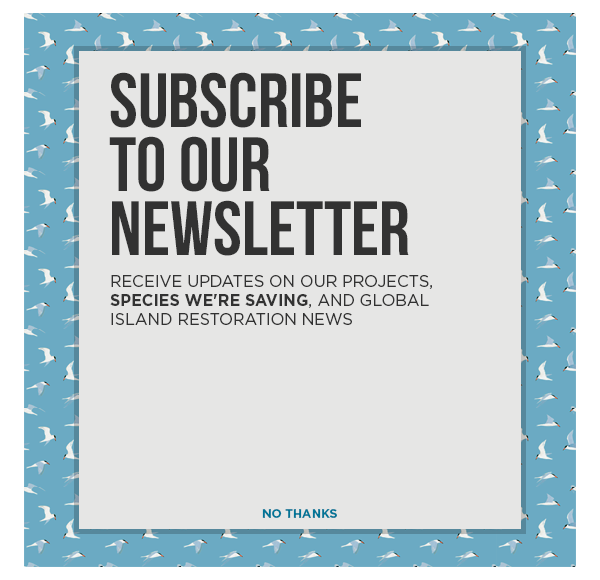 While research continues to understand their natural history, Island Conservation and our partners look to the future to ensure the continued survival of the Galápagos native species.